Lewis Hamilton delighted his home crowd by completing a hat-trick of consecutive victories at the British Grand Prix. The defending champion dominated in the changeable conditions to march to victory and in doing so became the most successful British driver at Silverstone with his fourth win. Hamilton has moved to within four points of Mercedes team-mate Nico Rosberg, who crossed the line in second place, but faces a post-race investigation by the stewards following messages transmitted to him over the radio as he battled a late gearbox issue. Red Bull driver Max Verstappen completed the podium places following another impressive performance. Dark clouds had loomed ominously above the Northamptonshire circuit and heavy rain began to fall 15 minutes before the race started. Race director Charlie Whiting took the unpopular decision to start the grand prix under the safety car and for the opening laps pole-sitter Hamilton led an orderly queue. But the defending champion - after nearly crashing into the safety car - urged Whiting to get the race under way and he finally got his wish at the end of lap five. Hamilton, a natural in the inclement conditions, opened up a four-second lead over Rosberg in just one lap. It was a statement of intent and one which would set the tone for the remainder of the afternoon. The track was quickly deemed dry enough for the intermediate tyre and it led to chaotic scenes in the pit lane as a host of cars jostled for the same bit of asphalt. The order at the front remained unchanged but with the circuit continuing to dry out, the question was who would pit for the slick rubber first? The answer was Sebastian Vettel at the end of lap 15. On track, Verstappen was chomping all over the back of Rosberg’s Mercedes gearbox and after nibbling away he made the move of the race stick when he passed the championship leader around the outside at Chapel. It was a fantastic move and one which will enhance the 18-year-old’s growing reputation. The top three were soon in for dry tyres and when the order shook out, Hamilton held a seven-second lead over Verstappen with Rosberg four seconds further down the road. While the majority of the track was dry, Abbey, the first corner, was still catching a number of drivers out. Fernando Alonso, Kimi Raikkonen and Carlos Sainz all endured hairy moments while Rio Haryanto beached his Manor in the gravel and retired from the race. Hamilton was the next big casualty after sliding off the road at turn one but he recovered to rejoin the circuit and lost just two seconds. Verstappen also ran wide at Abbey as he came under increasing pressure from Rosberg, and on lap 38 the German reclaimed second place as he passed the Red Bull driver around the outside at Stowe. That looked to be that, but with five laps remaining Rosberg suddenly reported a gearbox problem and at one stage it appeared as though he would be caught by Verstappen. Rosberg survived on the track but now faces an investigation from the stewards for the information relayed to him by his team over the radio. Red Bull’s Daniel Ricciardo crossed the line in fourth with Ferrari’s Kimi Raikkonen fifth. Jenson Button’s Silverstone hoodoo continued as he finished a lowly 12th while British rookie Jolyon Palmer failed to finish with a mechanical problem. 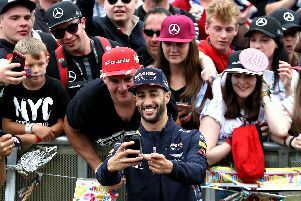 Hamilton, who jumped out of his car, leaped the barrier and took a bow in front of his adoring crowd, said: “I don’t know if you can be as happy as me but I am really happy. Thank you so much for coming out today. We have got the best fans here.